Snowmakers do not cry,we make snow! Everyminute of every day there is someone who passes. Some are hardly missed, some take a part of the lives that surrounded them in life and, others are like Jimmy! Jimmy is one of the few that has taken a part of an entire generation with him in passing! Jimmy was part of a generation who knew how to work hard, play hard and, laugh hard! His generation knew nothing more than hard work, true devotion, undying friendship and, kindness! Jimmy was always there for those that needed it no matter the time of day! When things went wrong, his cool collective mind could always be counted on. When you went to work, down in the dumps, Jimmy lifted your spirits, sometimes just by his presence. Jimmy's radiant energy and positive outlook permeated everything in life. Jimmy was a great amongst greats! The saddest part of Jimmy's passing is not for all those that have known him, but for those that did not yet have a chance to do so. In your honor, Jimmy, I make snow! 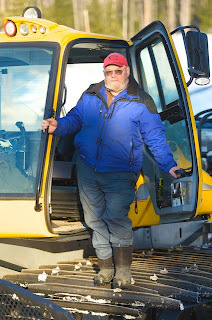 Peter Tessier along with all the snowmakers, groomers and, pumphouse operators of the past, present and future! I'm happy to have met and worked with Jimmy for a short time. He was a good man. My deepest sympathies to Andrea and the rest of Jimmy's family. Jimmy was the very Best Boss and teacher any man could have ever asked for. But above all He was also a Great Freind! From the day a Flatlander who knew nothing about a Ski Resort, Jimmy ( and his Son's) taught me everything and allowed me to grow through the ranks at Cranmore and do a job only a few can say they have held at Cranmore as Snow Surface Supervisor, I was proud and honored to have been givin this opportunity and with the faith Jimmy had in me. Even after I ended my career with Cranmore and moved back down south, Jimmy would keep in touch with me and I made sure I stopped in every time I was up thier to just catch up with him. I am glad I got to sit with him one last time just over a week ago early Sunday AM and as always I came away feeling good about myself because of the words of kindness and the humor Jimmy spoke. I will miss Jimmy and each time the warm weather turns to cold I will remember Jimmy Saying "fire them up" in reference to the snow guns and also for the night in early November 2003 when we showed up together at 3 Am to Make just a little snow and make everyone get in that winter Spirit. Thank You Jimmy! May you rest in Peace.